Matar (Peas) is a seasonal vegetable, which is available in abundance during winters. And winters are also the season when we make a variety of parathas. Since our appetite is healthy during the cold months, we make dishes that have lots of paneer and other milk products, which are more easily digested. So, what could be a more perfect weather than winter to make this to make the healthy, nutritious and delicious matar, paneer and cheese ka paratha? Don’t worry, the cold air will help you burn up all the calories! 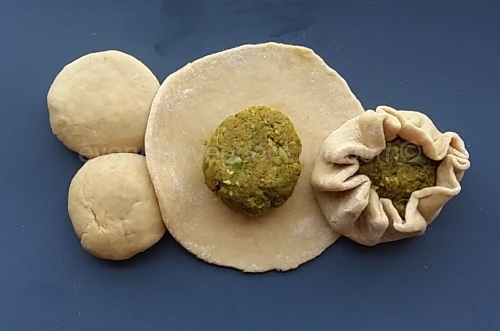 Frozen peas are available throughout the year so we can make matar ka paratha whenever using fresh peas imparts an excellent taste to the parathas. 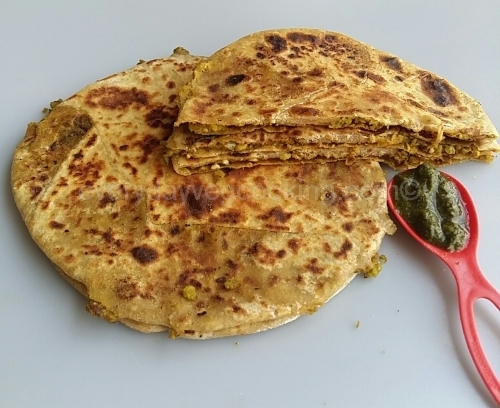 Usually, I make this paratha with peas and paneer, but when I make this paratha for kids I add some cheese to it for some extra nutrients and the exciting texture and flavour it gives the parathas. This mouthwatering stuff paratha is perfect for breakfast, brunch, lunch, dinner and for the lunch box. I use mustard oil to cook stuff parathas but you can use any vegetable oil, desi ghee or butter. Take aata in a paraat (large plate) or a mixing bowl and add salt and oil. Mix it by rubbing with fingers. Now add a little water at a time and knead the flour into a soft smooth dough. Apply a little oil on the dough, cover it and rest for 10-15 minutes. Knead the dough once again to make it smooth. Divide the dough into equal portions, a little bigger than a lemon and roll into balls. Oil or ghee to cook parathas. Put peas in the cooker, add 1 tbsp water and sprinkle some granules of sugar (this will help retain the colour of peas). Pressure cook peas for one whistle and switch off the flame. Let cooker cool. 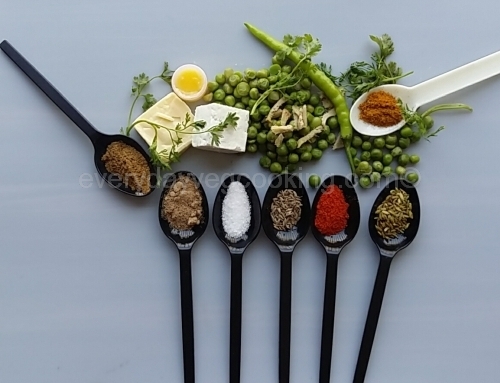 Coarsely grind peas, ginger, green chilli, coriander leaves, saunf and jeera. Heat 1 tbsp oil in kadhai. Add hing. 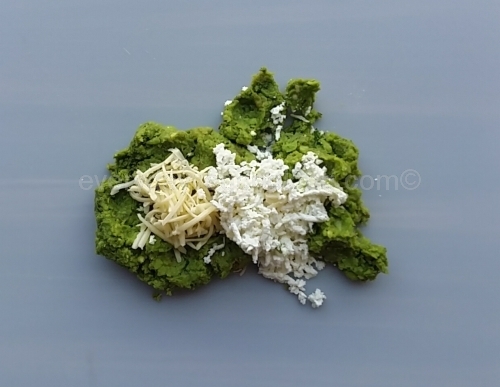 Now add the coarsely ground peas mixture, paneer and cheese. Add haldi, red chilli powder, salt, amchoor powder and garam masala powder. Mix all the ingredients well and cook on medium flame for 4-5 minutes. Switch off the flame and let stuffing cool completely. Divide the stuffing into equal lemon-sized balls. Take a ball of dough and flatten it. Coat both sides with dry flour and roll into a 3-4″ roti. Place stuffing in the centre of the roti, cover the stuffing by lifting all the sides of the roti and seal it together properly. Gently press it and coat both the sides with dry flour. Now gently roll into 5-6″ paratha, taking care to see that the stuffing doesn’t ooze out. Heat tawa (griddle) on medium flame and place the rolled paratha on it. Cook for some time, then flip the paratha using a spatula. A few light brown spots can be seen. Cook the paratha by applying a little oil or ghee on it and keep pressing with the spatula until brown spots appear on both the sides and it is well cooked. Matar-paneer-cheese parathas are ready to serve . Serve the parathas hot from the griddle, with coriander chutney or mint chutney, tamatar ki khatti meethi chutney or raita. Healthy and surely be a tasty one. Thanks Jyotirmoy Sarkar ji .